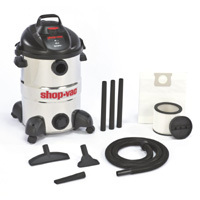 The Shop-Vac 5986200 comes in a durable, handsome stainless steel and has a 6.0 HP motor for extra power. We were pleased with its suction power; it handled wet and dry messes equally well. At nearly 24 pounds, it’s somewhat heavy, but its heavy-duty casters roll easily, and it has top and side handles for transporting it here and there. One thing we would have liked to see is onboard storage option. However, the accessories offered worked well and offer several functions. This Shop-Vac is a bit pricey at $126.99, but it provides a powerful motor, a durable stainless steel body, and an assortment of attachments.